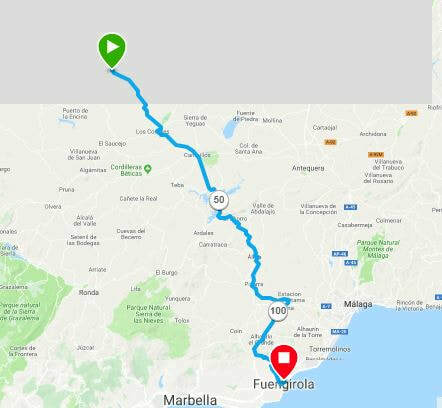 On the 16th June 2019, I will start my cycle which will see me leaving Santander airport and cross Spain towards Malaga airport. The idea is to cycle through most of Spain's fantastic Nature reserves and discover the "real Spain" away from the tourist trails. 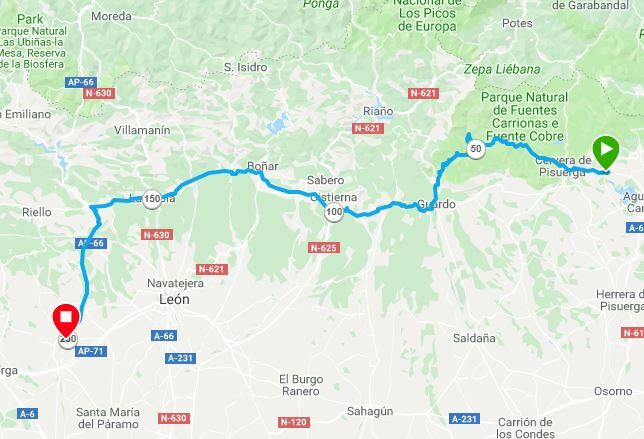 From the Parque Natural de Fuentes Carrionas e Fuente Cobre to the fabulous Parque Natural de Arribes del Duero to the peaks of Parque Natural Sierra de Hornachuelos , the the trip will see me cycling approx 1400km in 9 days climbing approx. 16800 meters. Day temperatures will be around 30 degrees, but can easily rise under the hot June sun. 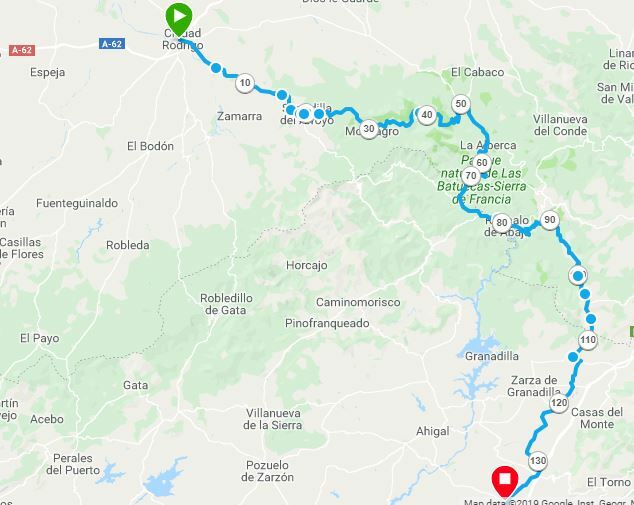 Along the route, I will visit tourist attractions, meet the locals and write about my adventures and discoveries in beautiful rural Spain. 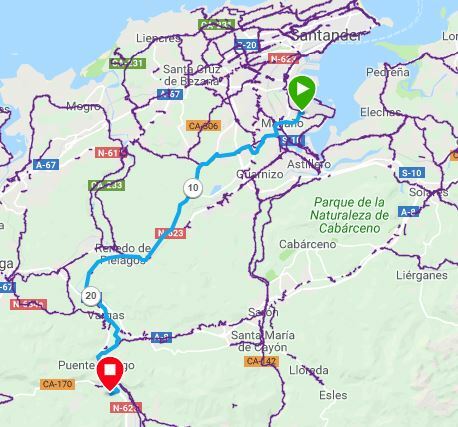 Day# 1 will see me arriving in Santander around 5pm . After having put the bike together, I will head towards Aes . Nearby Aes are the fabulous cueva de El castilla which I would like to visit. Day# 2 will be a tough day in the saddle. Where the distance is an easy enough 122.44km, it will be continuous climbing from the morning until the afternoon. Heading higher and higher, I will leaving Cantabria behind me and heading into Castile and Leon. 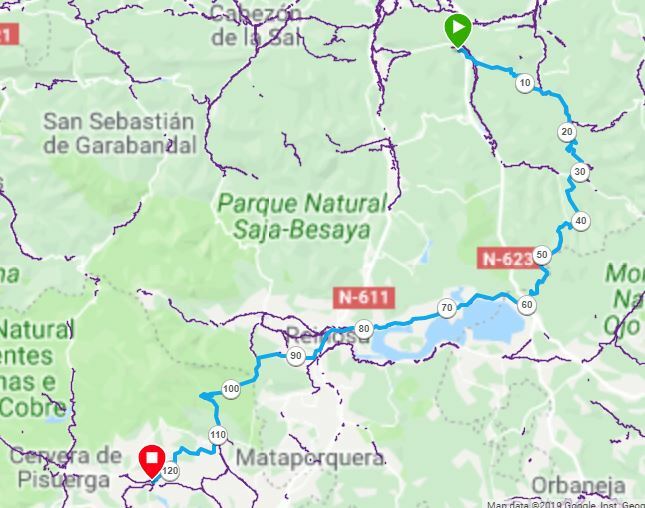 Cycling through Sierra del escudo and sierra de Hijar, the day will bring a total elevation gain of 2691 meters. Day# 3 will see another day of climbing (2302 meters of elevation gain). Especially the morning part will be a fabulous part of the route, heading into Parque Natural de Fuentes Carrionas e Fuente Cobre. The highest climb of the day will bring me to Mirador Alto De La Varga from where i will have fantastic views. From here, it will be back down towards the city of Leon which i will avoid following a more rural route. An easy enough day in the saddle only bringing a 1057 meter elevation gain. 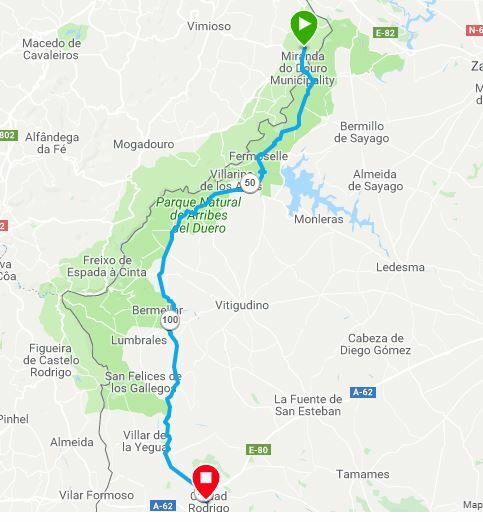 This cycle will see me visiting small rural hamlets heading into beautiful Portugal in the late afternoon. ​The afternoon will be spend discovering the region along the Douro. Day# 5 takes in the fabulous Parque Natural de Arribes del Duero, an area of extreme beauty. A hike to Pozo de los Humos waterfall is planned, although there might not be much water running in June. The end of the day will see me rolling into the city of Cuidad Rodrigo, famous for it's old town and 12th century city walls. Day# 6 is another short day, but one where the legs will be pushed again heading into the mountains covering an elevation gain of 2815 meter. The day will be mainly spend in Parque Natural de las Batuecas. 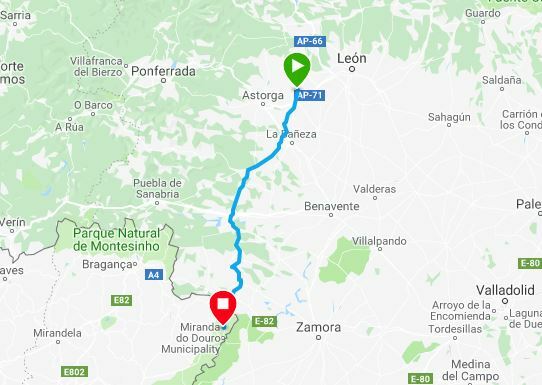 I will leave castile and Leon behind me and enter extremadura. ​Extremadura is famous for it's historical towns, but it is also a place where you have average temperatures of well into the 20s, so keeping the head cool will be important. Shortest day in the saddle. And the reason is that i want to spend a good bit of time in Caceres, a Unesco world heritage site. The beautiful historical centre with it's fabulous buildings will provide a well deserved rest in the afternoon. 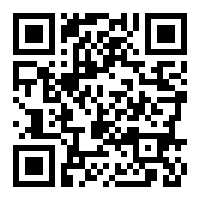 It will also recharge the batteries for the next day which will be the toughest cycle . The longest day in the saddle will be a hard day in the saddle under the heat of the Spanish sun. 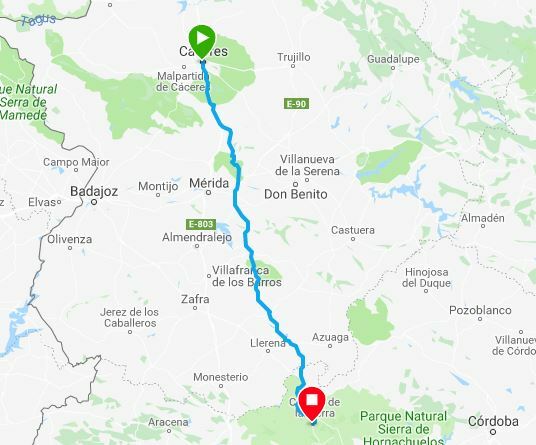 Leaving Caceres behind, I will be cycling through Parque Natural de Cornalvo where I will visit some of the Roman remains. The next is Sierra grande de Hornachos where I hope to have lunch in the beautiful town of Hornachos with it's Moorish past. 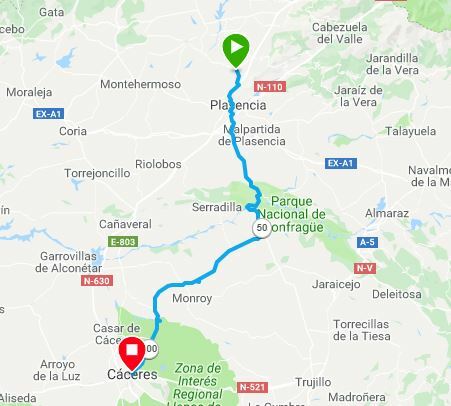 By late afternoon, I will reach Parque Natural Sierra de Hornachuelos where i will start a gradual climb towards Cazalla de la sierra. Todays trip is clearly devided in 2 different landscapes. 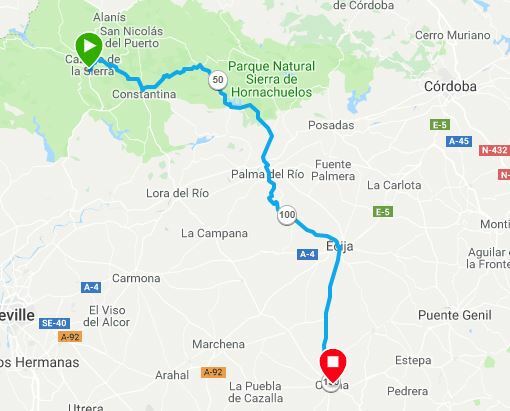 In the morning, I will be enjoying the beautiful hills of Parque Natural Sierra de Hornachuelos , in the afternoon I will be cycling through the lowlands along long straight roads where shade will be very hard to find. The last day on the bike, and it will be a beautiful route bringing me along the area of El Chorro, famous with rock climbers. 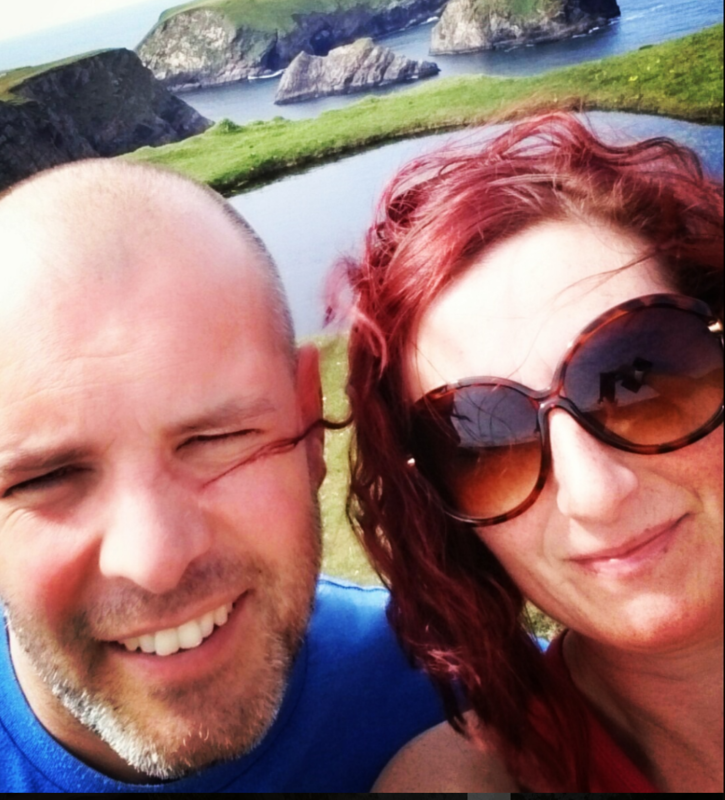 The last 20km will see me climbing again to finish in style reaching the fabulous sea again. And believe me, it will be celebrated with a refreshing swim.